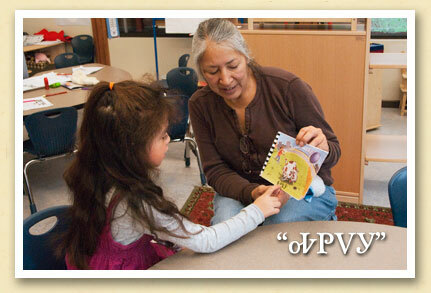 This child is learning the Cherokee language, which over the past century and a half has almost disappeared from use. In the late 19th century, in an effort to assimilate Native Americans into the European culture, the Bureau of Indian Affairs instituted boarding schools where children were immersed in the English language. In North Carolina, children attending these schools were prohibited from speaking Cherokee and, as a result, many gave up speaking their native language altogether. Throughout this period, a relatively small number of Cherokees continued speaking their native language. Yet these generations are gradually dying off — to the extent that today, of the 13,000 enrolled members of the Eastern Band, fewer than three hundred Cherokee speakers remain. Of those, most are over the age of 50 and are not likely to be raising children in the language. It’s estimated that within twenty years, no Cherokee speakers would remain …unless something changes. And things are changing. Today, a group of Cherokee school children are attending classes at the New Kituwah Academy where, for eight hours a day, Cherokee is the language spoken; and English is minimized. The Cherokee language immersion program is part of The Kituwah Language Revitalization Initiative, a project designed to reverse the loss of the Cherokee language and produce a new generation of Cherokee speakers. Now located in the renovated Boundary Tree Motel property on US 441 in Cherokee, the program began in 1994 with the kindergarten class and will eventually encompass pre-K through grade five. For more information, visit the school’s website, Fluent1.com.